This year, on the spur of the moment, I decided to “borrow” one of the trees to be planted in North Beach Park for a Christmas tree. This is neither strictly forbidden nor an accepted practice. Most people buy cut trees, after all, and the trees for planting are only a foot or so tall. 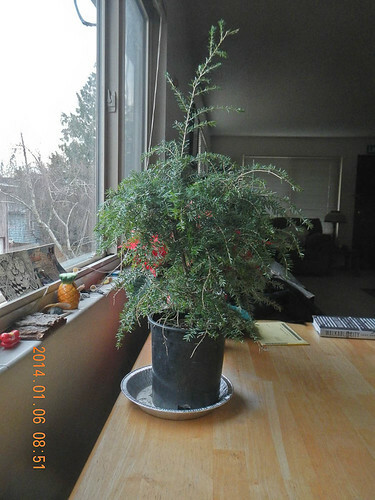 I picked a hemlock and decided I would plant it on January 6th. Which I then immediately realized would have been my mother’s 100th birthday. So it had to be. Further reinforcing this idea was that the 6th was a Monday, the day three of us usually work in the park. Here it is on the kitchen table. We didn’t really decorate it, just a couple strands of LED lights. Here is Tad, planting the tree. 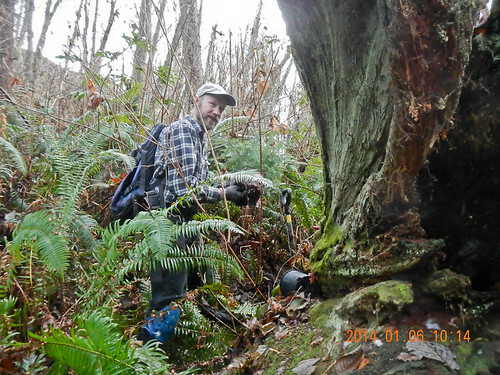 I’d picked a magnificent cedar stump that is one of a pair I call the Grandfathers because they’re so large. They’re upended in the stream, and must have fallen there after a landslide. Fallen trees or stumps become nurse logs for the next generation. They will be nurse logs as long as they were alive, and contain more living matter as a nurse log than they did as a “living” tree. 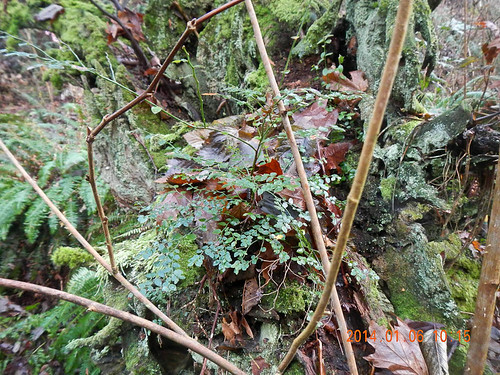 This picture shows how complex a nurse log garden can be; there is red huckleberry (Vaccinium parvifolium), salmonberry (Rubus spectabilis), sword and wood ferns, and several mosses and lichens. Red huckleberry and hemlocks are known for growing in cedar nurse logs and stumps. Another plant that grows well on cedar and conifer nurse logs is bunchberry (Corylus canadensis), a dwarf shrub in the dogwood family. We’re going to introduce that to the park soon. 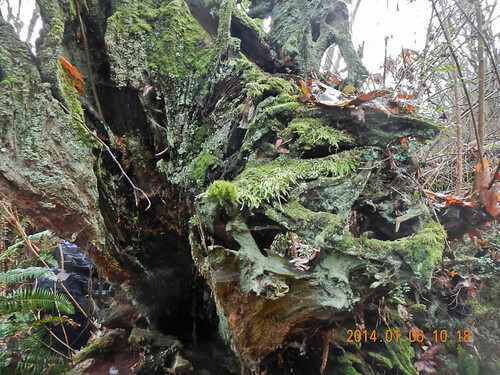 To give you an idea of the size of this stump, this picture was taken at my eye height, about five and a half feet. It reaches well over my head. 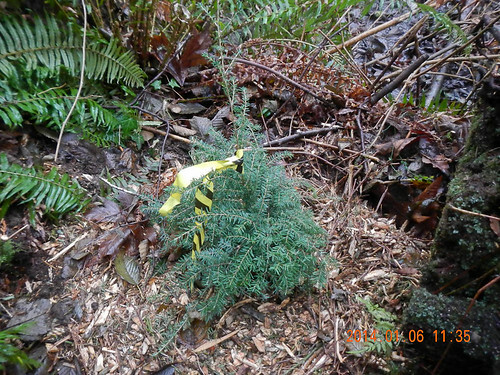 Here it is, all mulched in place and with its happy flagging tape. This lets us know it was planted in the 2013-14 planting season. As we walked away, I thought a little bit about calling the stumps the Grandfathers. Both my grandfathers were dead before I was born, and one grandmother died within a few months of my birth. The remaining grandmother was stern and not very warm. She lived down the street from us in a small apartment, then with an uncle, then with an aunt on the other side of the country. So I never really had the experience of grandparents. My nieces and nephews, however, had a great experience of grandma in my mother. She had 30 years as a grandmother, and loved every minute of it. Everyone called her Honey, all her children, grandchildren, nieces, nephews, and so on. My father, on the other hand, had very little experience as a grandfather, dying about two years after my first nephew was born. I felt that my parents were reunited now, and Honey could tell Daddy all her stories of being a grandmother.